Before YouTube and other music streaming apps came into existence, people listen to music by LP disc. Nowadays, people still sometimes prefer to listen to music by LP because they want to preserve the classic vibe. Some people may also collect the old LPs to create their own LP collection. If you are into LP collections these days, you might know the difficulty of keeping it clean. Those who owned a lot of LPs might know the struggle of cleaning the LPs, especially, the vinyl LPs that easily attracts the dust and hard to clean up. They can easily be damaged by heat, improper storage and also sunlight. Since LPs are really hard to take care of, you will need a proper storage to protect them. However, finding the good storage for your LPs might be a hard task since some record cases might not completely protect them from dust and warp. Meanwhile, if you are finding the best case for your Record, here are the top 10 best record cases that you might like. Without further delay, we start with the Retround Retro LP Record Case that is made of the durable hardware metal casing. This vinyl record case will protect all your records from dust and sunlight. Moreover, for better mobility, this case comes with the resin handle coated with chrome to prevent it from getting rust. Those who have a personal collection of vinyl records will love this case since it will organize all your records in one place and extend their lifespan. For the capacity of this case, it can store up to 30 albums that is the right choice for those who have a small amount of record collection. Taking care of your records might be a hard task if you do not have a proper case. With the JakeCube Design Leather LP Album Storage, all those difficulties will be forgotten. This is the perfect vinyl record case for your vinyl record collection with its gorgeous look to display your valuable LP albums. This case also comes with a handle for better transportation as well as durable construction to make sure that you can carry your collection to everywhere you want. For the exterior of this case, this box is covered with high-quality black leather with the gold metal knob which is the best fit for the luxurious looks and makes your LP album more visible. If you own up to a hundred vinyl records, some small cases will no longer satisfy you anymore. However, this Odyssey C45200 3-Row DJ Case is the answer to those hundreds of your records. Take a look at this case, it has 3-row with carpet finish for better storage and protects your records from dust. For the capacity of this case, it can hold 200 45 RPM record in total and that would be the ideal case for those who have been collecting the records for years. The handle of this case allows you to carry this case of the collection to anywhere you want. This record holder case is also equipped with two knobs to keep your valuable LPs safe and extend their lifespan as well. 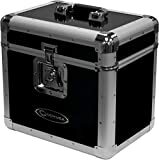 If you’re looking for album case to store your records, then this Odyssey KLP1-Black Vinyl Record Case can be the one you have been looking for. This case can hold up to 70 LP albums and 12″ Records. For this construction, this case has the detachable stacking lid for easy access to the records. On the top, it features the handle for better transport for one place to another. The locking knob of this case is to ensure the safety of your LP album and also protect them from dust and sunlight. You won’t have to worry about this case will slip away when you put it on the slippery surface since it comes equipped with the rubber feet to tackle those problems. Precious LP album will be a good fit with a luxurious case. In fact, the Victrola Vintage Vinyl Record Storage has all it takes for the luxurious look. On the exterior, this album case cover with black leather with the handle on top. This handle will allow you to carry it around to anywhere you want easily and conveniently. This vinyl record case can hold all of your favorite records such as 33’s, 45’s and last but not least, the 78’s. Keeping all your records, in this case, will protect them from dust and extend their lifespan so that you can enjoy listening to them longer than ever. Moving on to another elegant album case, we have the 1byone Vinyl Record Storage Case. 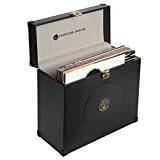 This portable record case can hold up to 30 albums which will be the best fit for personal collections or those who just start to collect the vinyl record. For the construction, this case is made of durable hardware metal casing for better quality and longevity to protect your record for years. For added convenience, this case comes with a handle for easy transport from place to place. Store all of your albums in this case to protect them from bumps, knocks, and dampness that these are the causes of them getting warped. 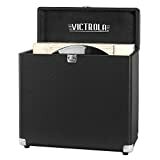 Once again, we have another Victrola on our list and it is the Victrola Vintage Black Record Storage. 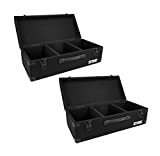 Storing all of your records in this case for dust free and scratch free also to extend their lifespan. This is one of the record carrying cases that comes with a holder for better transportation and also convenience to carry it around from one place to another. This case is also capable of holding more than 30 records including the 33’s, 45’s and 78’s. Moreover, the gold metal knob of this case will keep your all your records safe and maintain them in a good condition. For the top third product, we have the Odyssey Carpeted Case for Vinyl Record. This vinyl record storage case has the black carpet exterior lining which can perform better in dealing with dust than the leather. Furthermore, to ensure the safety of your vinyl record, this case is made of ½” thick plywood for better quality and protect your records from scratch and dust. 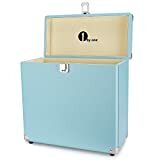 Moreover, those who want a bigger capacity to store all of their records, this case is the answer for you since it can store up to 200 45 rpm vinyl record. Protect your LP from scratch and dust with the Odyssey CLP90E Carpeted Lp Case. This case has a big capacity that it can store up to 100 LP case. This case also has the carpeted interior for better maintenance and protect your LP from dust, scratch and other means that cause them to get warped. Looking at the construction of this case, all of the corners are covered with rubber for anti-slippery and also act as a guard for your case as well. Last but certainly not least, we have the Crosley CR401-TA Record Carrier. This case has the storing capacity of more than 30 albums which is the perfect choice for personal collections and for those who have few amounts of LPs album. The handle equipped, in this case, is for better mobility so you can carry them to anywhere you want. It is made of metal for better quality and durability for heavy duty use. You have just browsed through the top 10 best record case reviews in 2019. Prevent your records from getting scratched and dust by storing them in the proper case. These cases are the best choice for you to store your records and extend their lifespan. If you still haven’t owned one, do not hesitate to get your preferred model soon.